This issue of the Networker is an attempt to explore what we can contribute as a profession to the “conversation about race,” which, as lame and ungainly as the phrase often sounds, keeps heating up around us, even as most of us have done our best to ignore it. 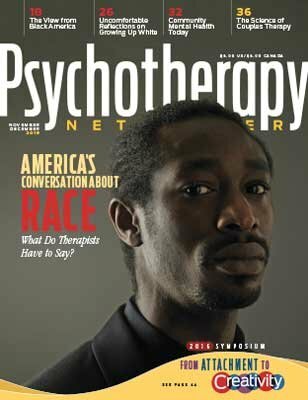 The intent is not somehow to analyze racism as yet another clinical problem that we can solve through our good intentions, insight, and therapeutic ingenuity, but to recognize the hard and uncomfortable truth of how racist oppression, explicit or implicit, doesn’t just harm “them.” Ultimately, it harms us all. Many poor, young, black people see themselves as trapped behind a wall-less prison with no exits. They know all too well that their daily experience—whether it’s going to lousy schools, succumbing to drug use and abuse, or being the victims of crime and lack of employment prospects—doesn’t matter unless it disrupts the lives of the white mainstream. The promise of the community mental health movement of the 1960s, providing high-quality psychological and social services to poor families, remains unfullled. But today, two professionals bring together both a grasp of broader social issues and a store of practical clinical wisdom to offer complementary perspectives on how to best help poor communities. The pioneers who birthed couples and family therapy never paused to scienti cally study the relationships they treated. Now, after systematically observing and doing therapy with thousands of couples, two of the field’s leading researchers summarize what they’ve learned about successful relationships and effective couples therapy. Has CBT Lost Its Mojo? Questions have been raised about whether the effectiveness of cognitive behavioral therapy, the field’s most researched treatment model, has been overstated. Traumatic experiences are often the root of athletic and other kinds of performance blocks. Author Steve Silberman discusses what it means to view autistic people as individuals seeing the world in a different way, rather than just a checklist of deficits. Sometimes it can be easier to argue about witch-hunts than risk confronting the dark, unsavory reality of child abuse. A son remembers a distant father and the bittersweet ritual that bonded them. What Do Therapists Have to Say?